Hey friends! I hope you are having a great weekend! I am kind of going it alone this weekend because my husband took Mr. 9 Year Old to Dallas to visit his brother and his family, and honestly I have been enjoying some alone time. I have spent some time doing some planning for the projects we would like to finish in 2017, and our kitchen is on the schedule to receive a little renovation in the Spring or Summer. We painted our kitchen cabinets when we first moved into this house. And then we did a faux subway tile backsplash that I still love. 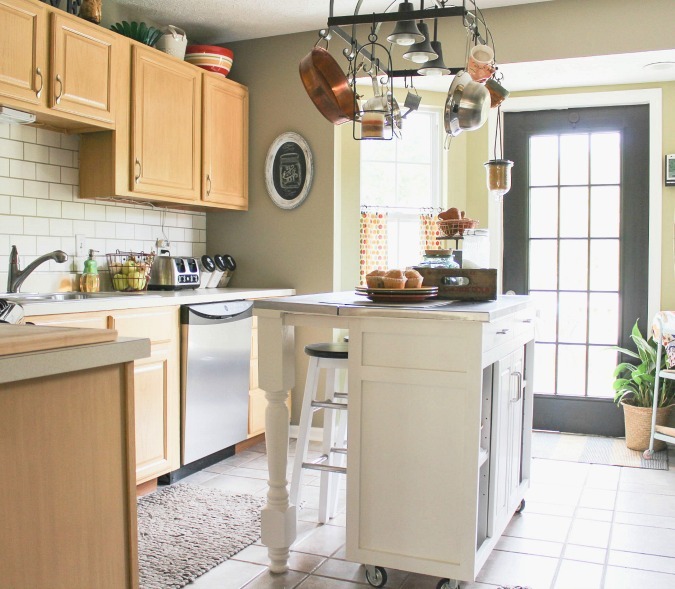 So today I thought I would talk a little about our plans for the new kitchen and share 5 Tips I have come up with for a budget kitchen renovation. Because you know I’m the girl with champagne taste and a tight budget, and we are going to stick to that mantra when we give this kitchen a makeover. Starting a brand new kitchen renovation can give you a bit of sticker shock. Prices for getting the look you really want can range in the tens of thousands of dollars. If your budget is smaller, you may have to cut corners to get your kitchen completed. There are some ways you can get the high-end look without the high price. Here are 5 budget-friendly tips to give you the look of luxury in your kitchen. A luxurious look starts with the bones of your kitchen, your cabinets. Average costs of a kitchen renovation are upwards of $10,000, with at least 30 percent of that devoted to new cabinets. Custom cabinet costs run even higher for those who want a unique design. If you don’t have that kind of money, you can still get the look of new cabinets if you choose to reface them instead. This process takes your existing cabinet fronts and replaces them with a brand new upgraded look. Labor costs are greatly reduced since there are no cabinets to hang. Or you can paint them, which is the route we will be going-again. It has been 4 years since we painted out cabinets, and the paint is starting to wear around the knobs and handles. I painted them with a brush the last time, and this time we plan on using a paint sprayer, and we are planning to paint them white! I’m taking some inspiration from this cozy kitchen, and am considering removing some of the cabinet doors like this. Your kitchen floor is another part of your room that could be instantly improved. Many people love the look of hardwood flooring in their kitchen, but they don’t love the price tag. You can get reclaimed wood planks at a fraction of the cost of new. Quality laminate flooring can also be a great substitute for expensive wood flooring. Today’s laminate manufacturers have plenty of affordable options for homeowners who want the look of wood. Or ceramic tile is a great choice for a kitchen. We are not replacing our floors because we love the grey tile that was here when we moved in. It is a classic look that won’t go out of style. 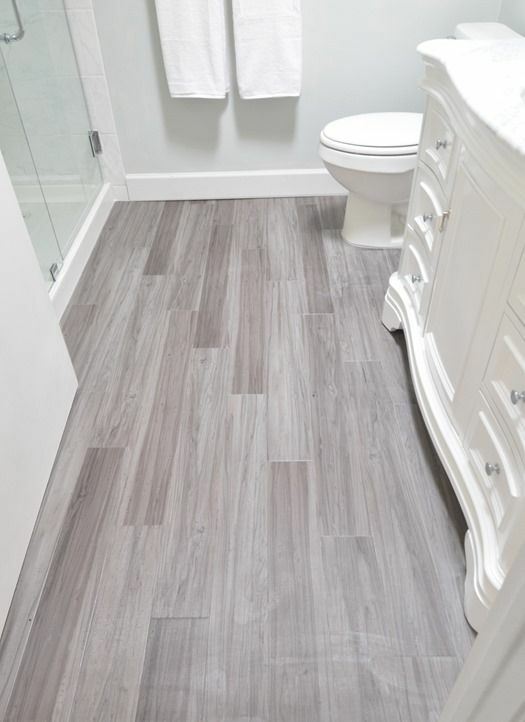 This is a bathroom, but these are vinyl tiles that look like wood flooring, and I love the look! Rich, gorgeous countertops are another selling point of many high-end kitchens in beautiful homes. You don’t have to sacrifice the dream vision of your kitchen’s look with ugly countertops. 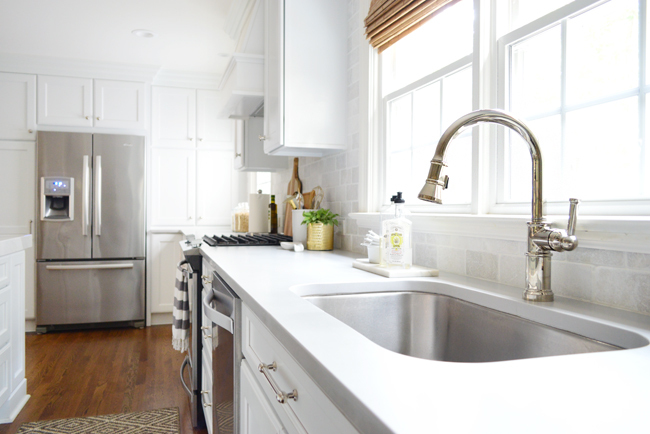 Some cost-friendly options that also give you a great look are granite tiles, quartz kitchen countertops, or butcher block surfaces, which may give you more for your money. There’s also the option of mixing and matching less expensive materials with a pricey countertop solution on an accent piece, like a kitchen island. See what you can do by looking at options from Superior Stone & Cabinet. We are planning to replace our countertops with quartz counters. 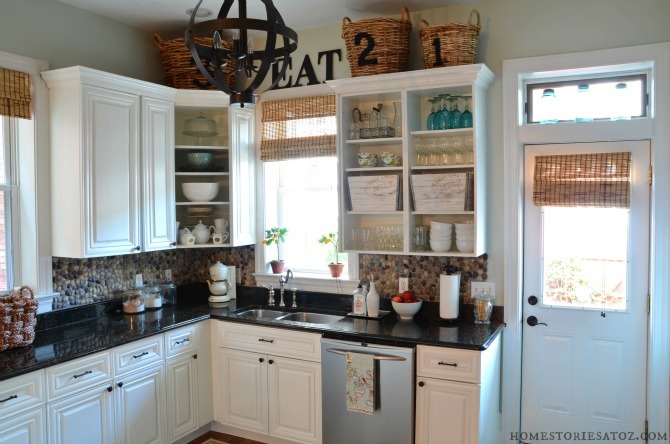 I want a neutral white color, and I love the counters in the picture below. I am thinking I want to go with something that looks very similar to this picture below. The accessories you choose for your kitchen can also increase the sophistication. Your faucets and other fixtures can get a rich look with inexpensive chrome or copper details. Drawer pulls and cabinet knobs are other spots where you could carefully pick luxe looks to elevate the style of your space. 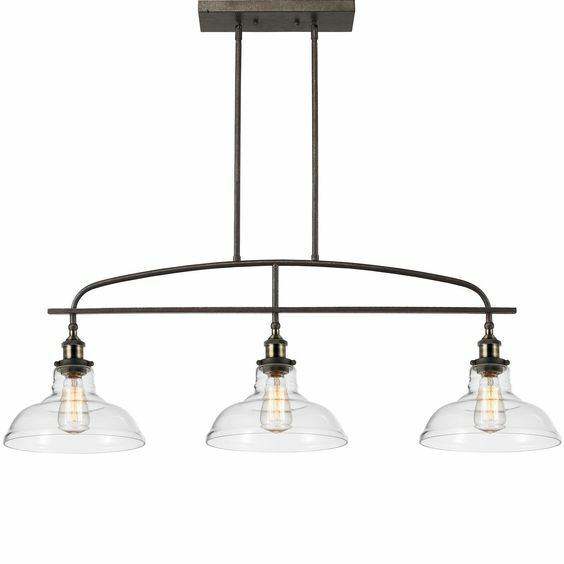 There are also lots of choices for lighting fixtures that look fancy but don’t cost very much. 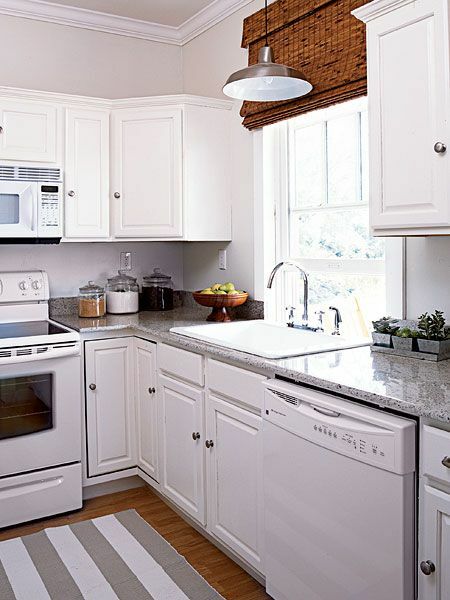 These features can give your kitchen that fancy, right out of a catalog look you may want. We currently have a pot rack/light over our kitchen island, but we are planning to replace it. It was here when we moved in and although is isn’t bad, i am tired of the heavy look. I want something that won’t make the kitchen seem even smaller than it is. I really like something like this. We would also like to replace our kitchen sink, since we will be replacing the counters. I want a stainless steel sink that is one big basin. Finally, you can continue to make your kitchen appear more upscale with special care when choosing appliances. Everyone loves the uniform and elegant look of matching stainless steel appliances. Get them cheaper with stainless steel finish appliances instead, and see your entire kitchen style coming together nicely. The finish is more convenient than the traditional stainless steel, as fingerprints easily wipe off. This year, make it your goal to get your kitchen looking the way you want. Spend less money than your neighbors on rich, quality looks in this important space in your home. Luckily, our home already has stainless steel appliances that are in great shape, so we will not be replacing them. I continue to love the look of stainless steel, as most people do. But if I needed to replace my appliances and wanted to stay on a budget, I think white appliances look great in white kitchens. We are also going to be replacing the door in our kitchen that leads out to our back deck. Our door needs replaced very badly, and I am so looking forward to this change. We are probably going to choose a door vey similar to the one we have now. which is mostly glass. We love the light it brings into the kitchen. And I plan to paint it black, just like the door we have now. We also plan to paint the walls a much lighter color and change up some accessories and things like that. The island is also going to undergo another small makeover. You can see where we added legs to our island last winter here. We also plan to added a rustic wood top to the island. We are very excited to get started with this renovation this Spring. And we will be sharing our progress and plans along the way. I hope some of these tips will inspire you if you are planning your own budget kitchen makeover. And may the rest of your weekend be great! For your convenience, this post contains affiliate links. If you click on them and purchase an item, I will receive a small percentage of commission. By clicking the link, you are NOT paying any more than you ordinarily would, and you are helping support me in keeping this blog up and running. This post was a collaboration, and I may have received compensation. However, all of the thoughts and opinions expressed here are my own. Looking forward to seeing more about your renovation this spring. The kitchen is my favorite room in the house. Love your ideas, thanks for sharing! My husband and I are wanting to remodel our kitchen, primarily focusing on the countertops. I had no idea that quartz counters could be a cheaper alternative to granite or marble. New counters is definitely something that our kitchen remodel needs and if there is anyway to save money, then we will do it! Wow, amazing post! Great tips about renovation of the kitchen. Creative ideas especially for someone who spends their whole day in the kitchen. Thanks for sharing! This is an amazing and incredible blog that features inspiring renovations and decors. I just so love it. Thank you for the inspiration. 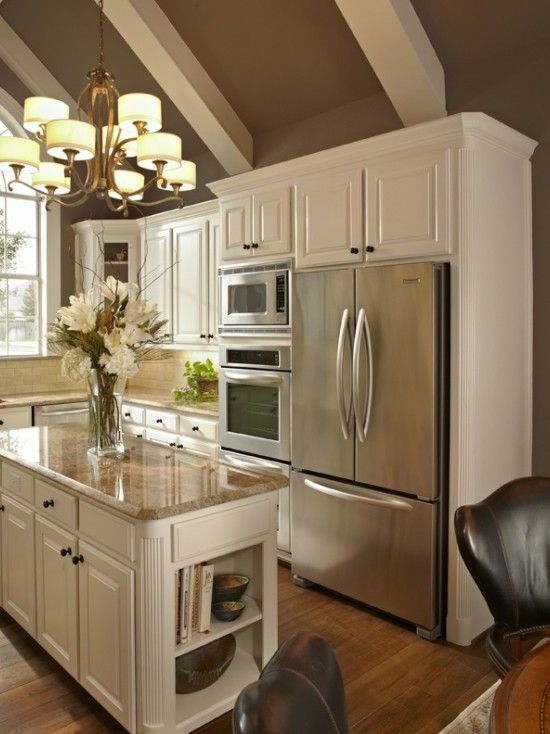 Kitchen remodels dont have to cost a fortune! With all the resources on the internet, like blogs like yours, there are so many options for awesome kitchen remodels. I like how you say that you would want to consider renovating the flooring. It would be good to consider this because it would really change the look of things. My sister is looking for a flooring contractor, so she’ll have to find someone with experience. Thanks for providing information about Budget Kitchen cabinets Renovation to the customer. Your blogs very nice and helpful for everyone.Thanks for truthly information provided on your site. I really like the idea of switching out all my appliances for stainless steel ones. Right now everything has sort of a linoleum covering and it’s starting to decay. It would be nice to have appliances that only need polishing every once in a while as opposed to a complete replacement. My wife and I have been looking for some options for kitchen remodels, and I think that being able to get some ideas would be good. I’m glad you talked about appliances, and I think that being able to get some quality ones would be good. I’m going to have to look for some good appliances and see what we can do for kitchen remodels! Really amazed at the design and architecture of your kitchen. your kitchen is just amazing. It’s bright and light. Amazing stuff you got there. I like how you mentioned that quartz countertops are cost-friendly and look great. My mom and I are renovating our kitchen and want new everything. Thanks for the tips on what to improve in a kitchen. Modular Kitchen is an essential part of a building/home. The above listed tips are great. Cheers!!! I am always looking for new ways to spice up my home a little. I really appreciated the tip about accessories and how they can increase the sophistication. It is a great idea to find inexpensive chrome or copper details to make things look a little fancier. Really I like your tip. Your tip is all very important and informative. Thank you so much for sharing these great points. I’m planning to do some renovation of my kitchen, I hope everything goes in the plan. Anyways, love this blog too. Kudos! Thanks for the tips on doing a kitchen renovation on a budget; they were very helpful. In my opinion, your cabinets are what’s going to make the biggest difference in the look of your kitchen. If you spend a majority of your money anywhere, I think it should be there. My mom is planning on renovating her kitchen soon, but she wants to keep within a budget. I will be sure to share this with her. Gas cooking equipment such as char boilers and commercial gas boilers have few moving parts, so any major problems, such as leaks or operational defects, can be detected easily. Hi!!! Very Well Organized and very informative article. Your Kitchen looks absolutely amazing after the renovation.thanks for sharing this. 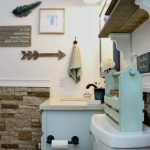 Thanks for the tips for kitchen remodeling. I love the tip about using granite or something for a nice looking, budget-friendly countertop. We’re looking to remodel our kitchen next year, so I’ll try and work that into the budget. The top 2 pieces to upgrade in a kitchen first are the ovens and the refrigerator. Generally, these are eye-catching and big, and you want to start with them! The trending stainless steel continues to sell at stellar paces, and in fact, the basic look of a kitchen that once was all white is not smashing when you introduce it to the sleek look of stainless steel as it is bold and beautiful. Renovaten recently posted…Top Kitchen Layout Mistakes You Should Not Make? Wow that first kitchen photo is very inspiring. I might try to get my house looking like that too. These are all great ideas, and they sound like they’d be pretty effective! Thanks for putting these out there! We’re planning an entire renovation this spring despite our tight budget. The kitchen is the place where I spend most of my free time. So, I like to cook all kinds of meals. Kitchen design is very important to me, so reading blogs like this is a real joy. Thanks for sharing! Really great tips. Buying refurbished kitchen tools is also a good choice in budget-friendly kitchen renovation.